What happens with Vizkopa Guildmage and various cards? Hi friend. 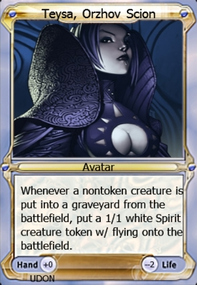 I run a version of this deck with Selenia, Dark Angel and have really considered Licia for red. There is an upcoming combo in this wheelhouse you may be interested in. Start with a Bolas's Citadel in play. Then Cast Doomsday . The cards you will pick (hopefully there are still in you deck) are Aetherflux Reservoir , Children of Korlis , Tainted Sigil , a land, and Beacon of Immortality . Depending on your life total after halving it you may want more 1 drops than anything. But the plan is to make it so Beacon of Immortality is the only card in your library and you keep casting it off the top. You gain infinite life. Aetherflux Reservoir , Sanguine Bond , or Vizkopa Guildmage finish off your opponents. I know this is a lot of cards you are not currently running. Just wanted you to have all the tools you might need. Yep, I got it. Been toying with random lifeloss ideas for awhile and discovered Pain's Reward the other night. Just took me awhile to figure out how exactly one would achieve say a million life--thanks! 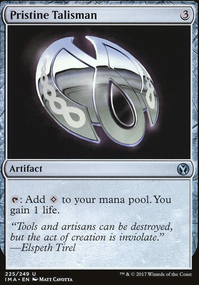 Love Sanguine Bond , but not the mana cost... Vizkopa Guildmage or both maybe for kitchen table madness! The deck I'm working on atm is very low cost and consists of different wincons. Children of Korlis and Pain's Reward might appear, but would be appearing for different reasons. But hey, if this million life thing were to ever happen in a game, it'd be hilarious. 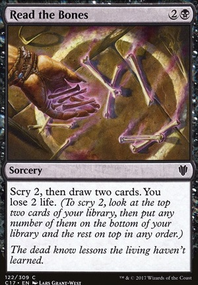 Might have to also make a really fringe deck that abuses all of these intricacies! Consider running more dual lands? They really help with the mana consistency of the deck. I noticed you aren't running Shambling Vent or Fetid Heath , some of the most powerful dual lands out there. I'm not a big fan of Hero of Precinct One . You don't have many multicolored spells, so once you get an Athreos, you could take him out to add one of your commanders in. You're missing some of the best removal spells. Swords to Plowshares and Path to Exile are some of the most played removal in White in EDH. Have you considered the Sanguine Bond / Vizkopa Guildmage and Exquisite Blood infinite combo? It can win you the game on the spot and all cards are very powerful on their own. I see that Exquisite Blood is already in your maybeboard, but I strongly suggest you add it in. I won't suggest anything else, as I sometimes feel that I'll kind of build the deck for you, and that just takes out the fun of the game for some people. If you want some more in-depth suggestions, feel free to ask. I added Vizkopa Guildmage and dropped Seraph Sanctuary . I have a similar commander deck, I love life gain strategies. 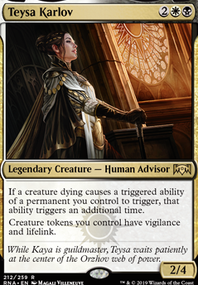 Vizkopa Guildmage would make a good addition, it acts as another sanguine bond and can give your non lifelink creatures lifelink. Just picked up a Vizkopa Guildmage . Do you know if the second ability stacks? I saw them at my lgs, so I picked up Endrek Sahr, Master Breeder and Thrilling Encore . What stuff is removable from this deck? You have a lot of ways to gain life in this deck, so will focus on cards you may have missed that work with life gain. 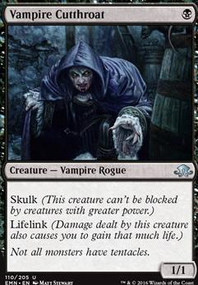 Cliffhaven Vampire , whenever you gain life your opponent lose life. 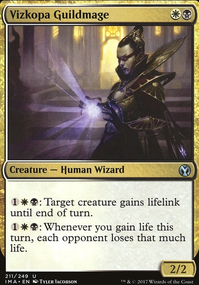 Vizkopa Guildmage , gains you life and a way to kill everyone if you gain a lot of life on a turn. Sun Droplet , gain a little life every turn. Righteous Cause , gain a little life every turn. This does make you a target sometimes, but you may want to try it out. Falkenrath Noble , another Blood Artist style creature; with flying! 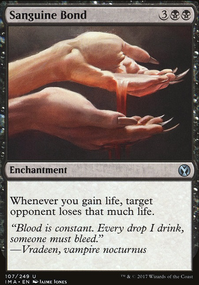 Sanguine Bond , just one of those cards for this archetype. Serra Ascendant , a 6/6 lifelink for one is good. Rhox Faithmender , gain even more life.